operative temperature is an attempt to provide a figure corresponding to the temperature actually experienced by the body. The operative temperature includes air temperature, radiant temperature asymmetry and air velocity in one figure, which corresponds to the temperature a person would experience in a space with uniform air and surface temperatures and no air movement. The operative temperature is an intuitive representation of the temperature experienced in a room. However, it does not provide an indication of how the thermal environment is experienced, as activity, clothing and expectations are not taken into account in the value. PMV is commonly used in scientific literature and is described in ISO 7730. PMV takes into consideration the six parameters mentioned in section 3.1.2 (metabolic rate, clothing index, air velocity, radiant temperature, air temperature and RH). PMV is a seven-point scale ranging from cold (-3) to hot (+3) with 0 as neutral. The PMV value can be a better indication of how the thermal environment is experienced than the operative temperature alone, but it is a more abstract term to many people. From the PMV index, it is possible to calculate the percentage of people who would be dissatisfied with a specific thermal environment (the Predicted Percentage of Dissatisfied, PPD). PMV is a very technical term and can be difficult to communicate. Instead, a fictive temperature, the experienced temperature, can be calculated from the PMV value. This can be done to explain effects of changes in PMV, for instance, higher or lower air velocity, humidity or radiant temperature. Experienced temperature can also include the effect of direct solar radiation and is often relevant when the effect of windows in combination with shading is evaluated. Most of the background for the PMV index is based on studies in climate chambers, which can be very different from a normal office or home environment.As an alternative approach, thousands of building occupants have been involved in field studies in real buildings, where measurements and questionnaires have been used to correlate the temperature to the thermal sensation experienced by the occupants. The results show that, in buildings with natural ventilation, the outdoor temperature during the previous week has an influence on the temperature we accept indoors on a given day; the higher the outdoor temperature, the higher an indoor temperature we accept. Adaptation requires access to openable windows, and that the occupant has freedom to adjust clothing. Part of the explanation of adaptation is that a psychological process is involved. See section 3.6.4 for an explanation of how the adaptive approach is used for classification of thermal comfort. The thermal environment can be evaluated by measurements of four of the six parameters: air temperature, humidity, radiant temperature and air velocity. The last two parameters need to be estimated from tables, for instance in (CEN, 2005). Measured data can be used to illustrate the effects of changes in the parameters. It cannot always be used to evaluate the thermal environment as it applies only to the situation when measured. Also, other factors influence occupants' thermal sensation. For instance, moods can have a positive or negative effect on expectations. Surveys made by occupants can help identify possible problems with the thermal environment. Alongside measurements, questions like: “Do you feel hot/cool?” or “Would you prefer it to be warmer or colder?” can help to identify user preferences. A disadvantage is that thermal sensation is subjective and is based on expectations. Again, the psychological state of the occupants will play a large role. If a survey is made in a house occupied by one family and adjusted to their preferences based on surveys, other families might not agree with that. A dynamic simulation can be used to predict the risk of overheating in a building. The simulation calculates the heat balance of the building consecutively for each time step. The results show the energy use of the building, but also the temperature. When evaluating dynamic results, the number of hours out of the thermal comfort range is the typical method. The hours to be counted are the occupied hours – 5% of those are allowed to be out of range, based on EN 15251 (CEN, 2007). When making dynamic simulations, the criteria are taken from various standards or legislation and will apply to the average population. The VELUX Energy and Indoor Climate Visualizer can be used for such evaluations. For a description, see section 2.7.1. A study made on passive cooling methods in warm climates is an example of the use of the VELUX Energy and Indoor Climate Visualizer for thermal comfort evaluations. Simulations made for Malaga, Spain show that passive measures, such as airings and the use of solar shading, can almost eliminate the use of a cooling system (Asmussen and Foldbjerg, 2010). The figure illustrates how the operative temperature is kept in the comfort band (shown in grey) with the use of passive cooling methods, whereas no actions result in significant overheating. The results are also quantified as the part of year with good and poor thermal comfort, again showing large improvements of thermal comfort. 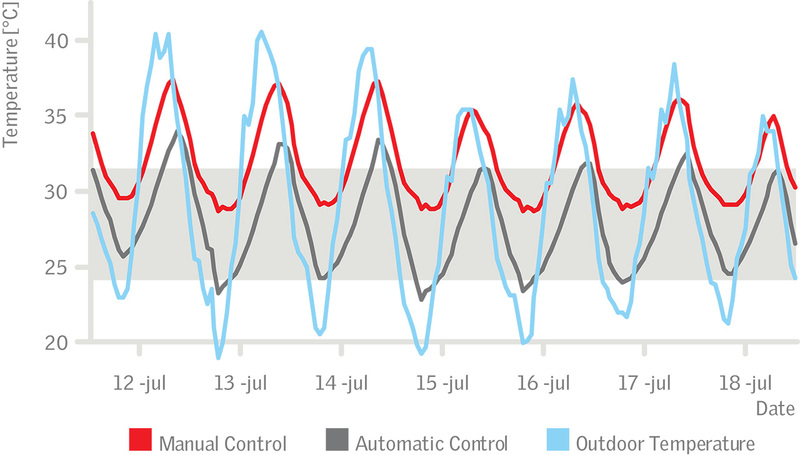 ​Figure 3.6.1 The indoor and outdoor temperature by different control methods in June in Malaga, Spain (Asmussen and Foldbjerg, 2010). 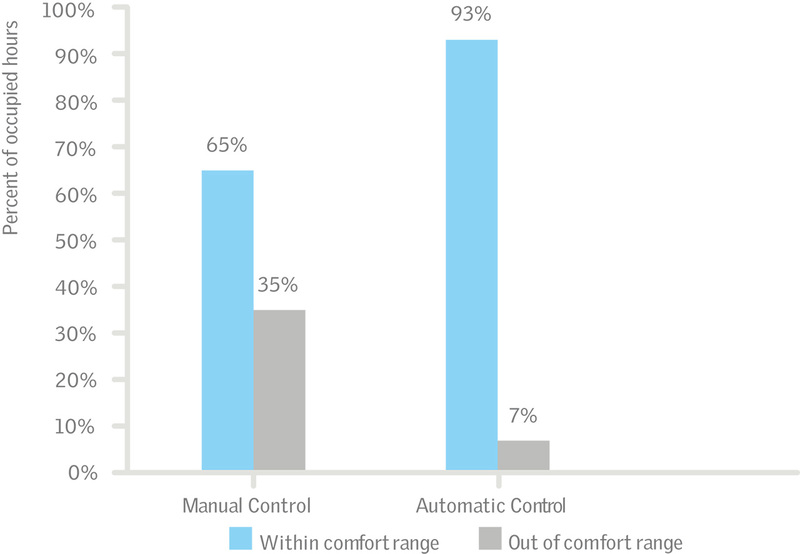 ​Figure 3.6.2 The part of year within and out of comfort range by different control methods in Malaga, Spain (Asmussen and Foldbjerg, 2010). Building regulations have traditionally focused on minimum temperatures during winter to ensure an adequately heated indoor environment. With the move towards more energy-efficient buildings and the associated increased risk of overheating (as discussed earlier), some countries are introducing requirements for thermal comfort during summer. This can be based on simple indicators, e.g. a maximum temperature of 26°C that can be exceeded for 100hours per year. A classification of the thermal environment is defined in most standards. In EN 15251 (CEN, 2007), three classes (I, II, III) are defined. 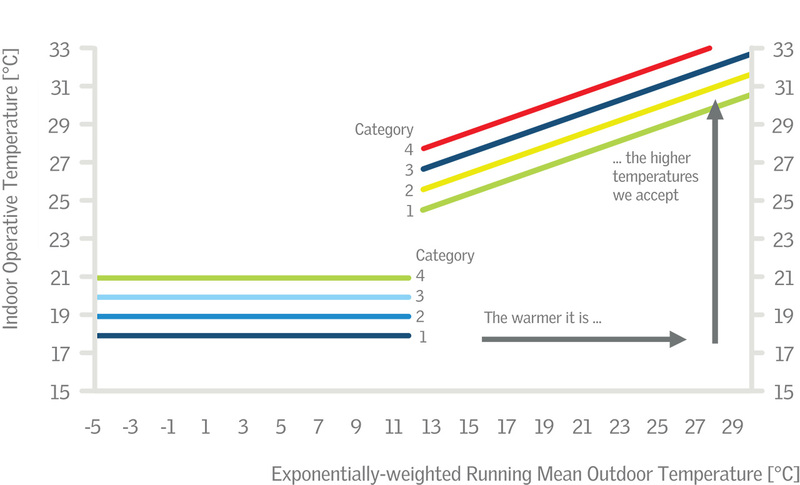 Each class defines a range of temperatures around an “optimal” temperature, e.g. between 21°C and 26°C. When the indoor temperature remains within this range, the room is in category I. For naturally ventilated buildings the adaptive approach is used, so there is no fixed upper limit, see figure 3.6.3. Some situations will require an increased use of energy to achieve a higher category as more heating may be required during winter. It is therefore important to consider the needs of the building occupant when deciding on the design target category. For most building occupants, category II will be sufficient. The Active House specification 2.0 uses the adaptive method as defined in EN 15251 (CEN, 2007). ​Figure 3.6.3 The adaptive comfort principle as used in Active House specification, based on EN 15251. Asmussen, T. F., Foldbjerg, P. (2010) Efficient passive cooling of residential buildings in warm climates, Submitted for PALENC 2010. CEN (2005) EN ISO 7730: Ergonomics of the thermal environment. CEN (2007) EN 15251: Indoor environmental input parameters for design and assessment of energy performance of buildings.